What is Crizonix (Crizotinib) used for? Crizonix is a medicine used to treat cancer. Specifically, it is used to treat locally advanced or metastatic non-small cell lung cancer (NSCLC) that is anaplastic lymphoma kinase (ALK)-positive or ROS 1 positive. The active ingredient in Crizonix is called Crizotinib. Crizotinib is an oral receptor tyrosine kinase inhibitor. How should I use Crizonix (Crizotinib)? 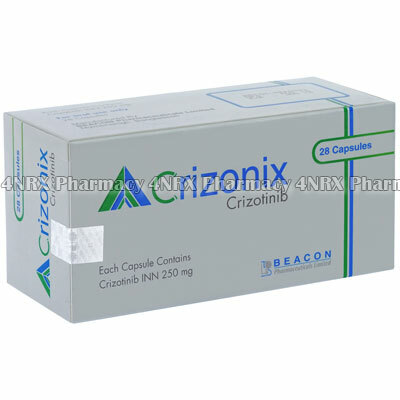 Crizonix is packaged in a box of 28 capsules, each capsule containing 250mg of Crizotinib. Your doctor should advise you on the correct dosage of Crizonix to take, how often to take Crizotinib, when to take Crizotinib and how long to take Crizotinib for. What are the side effects of Crizonix (Crizotinib)? Other serious side effects Crizotinib can cause include pneumonitis, QT prolongation and hepatic alterations. Crizonix can be used by adults with ALK-positive advanced NSCLC (non-small cell lung cancer) or with previously treated ALK-positive advanced NSCLC & ROS1 (+) NSCLC.